Nestle is paying the French firm DBV Technologies up to €100 million to develop a milk allergy test. 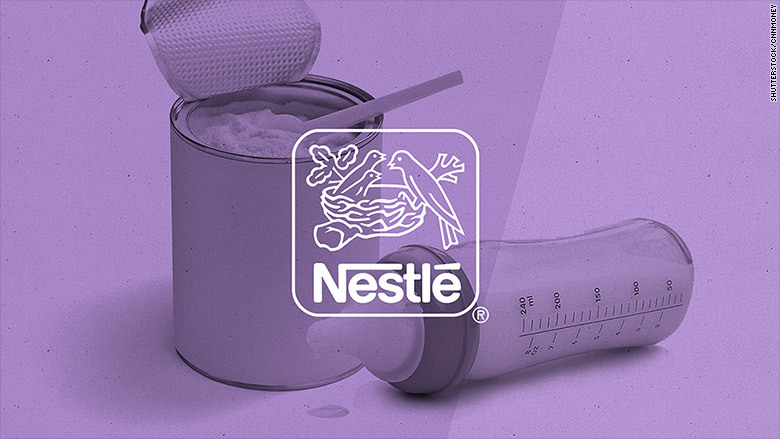 Nestle has come up with a novel, long-term plan that could help it sell more baby formula and milk products. The company just committed to pay up to €100 million ($112 million) to develop a milk allergy test for babies to determine whether they suffer from an allergy or intolerance to cow's milk. Experts estimate that 2% to 3% of infants globally are allergic to cow's milk, which can cause a range of reactions including vomiting, nausea and diarrhea. But it's very difficult to diagnose. Without a reliable test, some parents and doctors assume that infants (as many as 15%) have the allergy, leading them to remove milk products from their babies' diets as a precaution. The test -- which is being developed by the French biopharmaceutical firm DBV Technologies (DBVT) -- could ultimately help Nestle (NSRGY) market its infant formula to parents who would otherwise avoid milk-based products. And it could help Nestle market its hypoallergenic and non-allergenic products -- Althéra, Alfaré and Alfamino -- which specifically cater to babies with cow's milk allergies. DBV Technologies expects the diagnostic test will be submitted for worldwide regulatory approval by 2021. The test is set to come in a ready-to-use patch that can be applied to a baby's skin to test for redness. "This innovation can become the breakthrough diagnostic for [cow's milk allergy]," Greg Behar, CEO of the Nestle Health Science division, said in a written statement. "Early diagnosis and nutritional intervention helps get infants happily back on the path of healthy development, alleviate the anxieties of parents and reduce healthcare costs," he said. DBV Technologies said it was too early to say how much the test would cost or how it would be sold. But Nestle would be in charge of commercialization and sales. The Nestle unit that sells infant formula and baby food had sales of 10.5 billion Swiss francs ($10.6 billion) last year, which is roughly 12% of global sales. Nestle's separate milk and ice cream business had sales of 14.6 billion Swiss francs over the same period. Nestle's investment in this milk allergy test "exemplifies Nestle's push into more science-driven solutions to nutrition, nutritive deficiencies and allergies," said Robert Waldschmidt, an equity analyst at the investment bank Liberum in London.